Missouri State Sen. Maria Chappelle-Nadal (D) says there's "no way in hell" she will be resigning from her post, despite pleas from prominent state Democrats and Sen. Claire McCaskill (D-MO). In a now-deleted Facebook comment, Chappelle-Nadal said that she hoped President Donald Trump would be assassinated. The comment reads "I hope Trump is assassinated!" and is in reply to a family member of a Secret Service agent who was wondering if someone would attack the president. 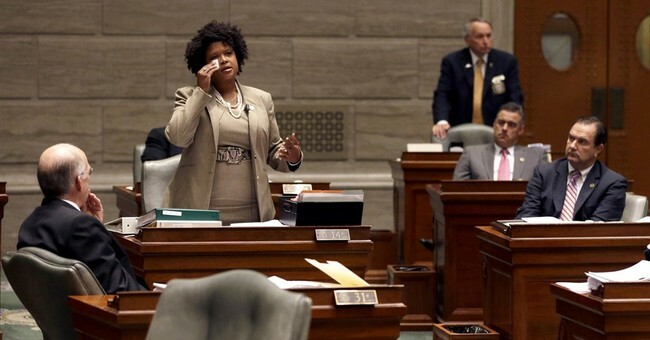 Chappelle-Nadal told Missouri station KMOX that since other members of the legislature had not resigned despite marital infidelity and smoking in the capitol, she would not resign either. Chappelle-Nadal referred to the comment as a "mistake" and said that she is "owning up to" it. She also said that while she wished she had chosen better words, she stands by the frustration and anger that led her to say she wished that the president was dead. First off, no, this isn't a mistake--this is saying that you hope someone kills the president. It was certainly wrong to say it, but it was done quite purposefully. Second, it seems as though this is some sort of a trend--in Maine, a state representative was punished and removed from various committees after saying that he'd make Trump a "half-term president" if he ever came near him. Chappelle-Nadal's comment was completely out of line. It's not funny to joke about someone killing the president--regardless of who the president is or how angry he may make you.